After starting off the week with a couple of real downers - Simon Cowell's possible departure from American Idol, Friday's season finale of Terminator: The Sarah Connor Chronicles -- the second half of this week provided a slew of uplifting stories. From Susan Boyle's unlikely stardom (watch her Early Show appearance below) to Matt Giraud's elimination save on Idol, there was a lot to feel good about, too. 10. Attention Twi-hards: Summit finally announced the rest of the New Moon cast. Did they get it right? 9. Have you seen the newest Harry Potter trailer? Three letters: O. M. G.
8. Simon Cowell is rumored to be leaving Idol at the end of this year, and Adam B. Vary isn't surprised. 7. Michael Slezak suggested a slew of songs for the Idols to sing on this week's Quentin Tarantino-mentored cinema night. 6. Adam B. Vary (and Smirkelstiltskin) reported on the scene from the American Idol performance and results shows. 5. Jeff Probst dedicated his weekly Survivor: Tocantins blog to the man everyone loves to hate, Coach, and the TV show he'd like to pitch about said man, The Dragon Slayer. 4. According to Benjamin Svetkey, Friday's season finale of Terminator: The Sarah Connor Chronicles ''left more than a few plot points hanging tantalizingly over cliffs.'' What did you think? 3. You reacted to American Idol's Songs of the Cinema week performances, and to the ''historical'' results show where the judges finally used their power to save a contestant from elimination. 2. Another week, another number one ranking for Adam Lambert on the American Idol Power List. 1. 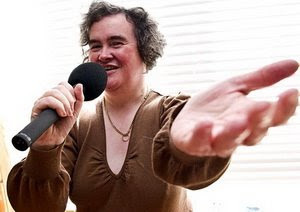 Britain's Got Talent contestant Susan Boyle became an unlikely star this week. The dowdy-looking Scot initially drew snickers when she appeared on the reality show, but her outstanding performance of a Les Miserables tune led Simon Cowell to his feet, Lisa Schwarzbaum to tears, and Adam Markovitz to wonder what the big deal was (and hoo boy - you told him).